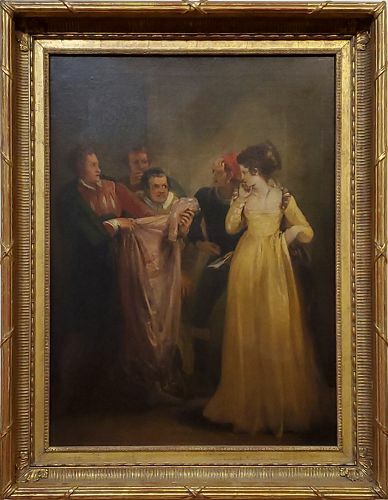 Depiction of Katherine in the Taming of the Shrew, Shakespeare, oil on canvas, unsigned. Provenance Feignin Galleries--see label. who believed it to be by the artist. In custom fluted cove frame Thomas Stothard was born in London, the son of a well-to-do innkeeper in Long Acre A delicate child, he was sent at the age of five to a relative in Yorkshire, and attended school at Acomb, and afterwards at Tadcaster and at Ilford, Essex. Showing talent for drawing, he was apprenticed to a draughtsman of patterns for brocaded silks in Spitalfields. In his spare time, he attempted illustrations for the works of his favourite poets. Some of these drawings were praised by James Harrison, the editor of the Novelist's Magazine. Stothard's master having died, he resolved to devote himself to art. In 1778 Stothard became a student of the Royal Academy, of which he was elected associate in 1792 and full academician in 1794. In 1812 he was appointed librarian to the Academy after serving as assistant for two years. Among his earliest book illustrations are plates engraved for Ossian and for Bell's Poets. In 1780, he became a regular contributor to the Novelist's Magazine, for which he produced 148 designs, including his eleven illustrations to The Adventures of Peregrine Pickle (by Tobias Smollett) and his graceful subjects from Clarissa and The History of Sir Charles Grandison (both by Samuel Richardson). From 1786, Thomas Fielding, a friend of Stothard's and engraver, produced engravings using designs by Stothard, Angelika Kauffmann, and of his own. Arcadian scenes were especially esteemed. Fielding realised these in colour, using copper engraving, and achieved excellent quality. Stothard's designs had an exceptional aesthetic appeal. He designed plates for pocket-books, tickets for concerts, illustrations to almanacs, and portraits of popular actors. These are popular with collectors for their grace and distinction. His large oil paintings were not numerous but he executed pictures for Boydell's Shakesphere Gallery and for The Poetic and Historic Galleries of Bowyer and Macklin!